The two principle affirmations of Inner Sage Tao, The Central Room and Bright Virtue (see also The Reading Room, Introduction to the Primary Affirmations of Inner Sage Tao), are in a sense commentaries on the Ming-te Mandala and are designed to help the student maintain and extend their accomplishments in Inner Sage Tao. In its basic form Inner Sage Tao has two aspects one of inward focused experience which is the Central Room, an area defined in creative imagination and the other an outward focus that centers on the student’s Middle Tan, roughly the area of the Chest, and extends itself through the Six Degrees of Connectedness (the Inner Sage version of the six degrees of separation), to encompass the whole world. In both of these the Inner Sage as the manifestor of the Ming-te Mandala is the central focus. The Ming Te Mandala consists of several elements drawn from ancient Chinese sources and the Affirmations repeat these elements as part of their form. The most important of these is Ming-te or Bright Virtue, which is conceived of as a Golden Light. This Golden Light is the result of the union of three other potentials, these are Numinous Mind (Shen), the Center or centeredness (Chung), and wholeness/completeness (Cheng). In the Ming-te Mandala these are the three points of the triangle in the center and are represented by their Chinese Characters. In the middle is the large circle which has the characters for ming or bright and te or virtue. This is represented by a golden light because yellow or gold is traditionally the color of the center in Traditional Chinese Cosmology, and the notion of the center or “golden mean” is one of the most profound and influential in traditional Chinese thinking. The ideas of Centeredness and Completion are further represented on the Mandala in the “natural” symbols of the Pole Star and the Dipper for the center and the Twenty-eight Constellations. 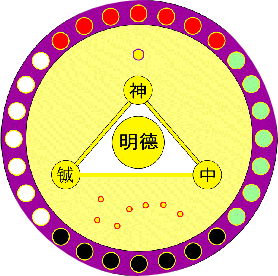 In ancient Chinese cosmology the Pole Star is the Center of Heaven because all of the Stars revolve around it. The Dipper which always points to the Pole Star is an important symbol of direction and guidance as well as of protection. A great deal of Chinese esoteric lore deals with the powers of the Dipper and how to access them. Surrounding all of this is twenty-eight smaller circles in a band that represent the twenty-eight “lunar” constellations. The Band itself is purple, a color representing the dark void of space, the pacing of which was a favorite pastime of Taoist adepts. Their four colors represent the four sacred animal guardians of the directions, the Red Bird of Fire is at the top, the Green (it is sort of a blue-green like fine Chinese turquoise) Dragon of Wood is on the Right, the White Tiger of Metal is on the left and the Black Tortoise of Water is below and Taoist Adepts use this form in their Ritual/Meditations such as the Rite of Cosmic Renewal (See Saso 1972, p 70.). Behind this celestial symbolism is the notion of Heavenly Nature, which is our which is our True Human Nature and in the Mandala is represented by Shen, or numinous mind, which is what allows us, literally in meditation, and figuratively in everyday life, to “reach for the Stars”. And in coming to rest in the fullest attainment of the good. Important aspects of Chung (Centering/Balancing) and Ch’eng (Sincerity/Completion) are dealt with in the Chung Yung (Zhongyong) best rendered by Plaks as the Practice of the Mean rather then Doctrine of the Mean which has almost been standard since Legge. In the Chung Yung, yung is introduced as more than moderation, as a simple mean in conduct, but rather as a state of Human Consciousness and also as a fundamental aspect of Cosmic Creativity. The Chung Yung continues to define in cosmic and human contexts when it expounds ch’eng, which is conventionally rendered as sincerity, but has cognate meanings of authentic and real and also within the context of the Chung Yung a specific meaning of wholeness, completeness and integrity, with a powerful subtext of creativity emphasized by Tu Wei-ming (Tu Wei-ming 1976). The concept of ch’eng is so important that I created a special Mandala called the Sincerity Mandala which appears in the upper left hand corner of some of these pages. While the commentary on the Sincerity Mandala is in need of revision, you can increase your acquaintance with of ch’eng by reading the short Commentary on the Sincerity Mandala. The concept of shen is represented by the top point of the triangle. It enters Inner Sage Tao from a short treatise, Nei Yeh (inner cultivation) from the Küan-tzu (Guanzi) a larger collection of texts from the Warring States Period, with some perhaps from the early Han Dynasty. This short work has been translated as a separate work by Roth, and also as part of a collection of translations from the the Küan-tzu and a complete translation by Alan Rickett. The work is echoed in several important places in the Mencius and a good case can be made that it was strongly influential in the Mencian branch of Confucianism. Roth is at great pains to minimize the Confucian aspects of the text, recognizing only one of the echoes in the Mencius and playing it down to a passing semblance. Waley is more generous to Mencius and in the Introduction to his translation of the Tao Te Ching (The Way and its Power, pgs. 33-34, 48-50, 55, 57-58) points out a large number of echoes that make the potential relation between the Nei Yeh and Confucianism hard to ignore. Graham (Graham 1991, p. 100) considers that Nei Yeh originates at a time before there was a serious split between Confucianism and Taoism. Originally shen seems to have been a heavenly spirit, a revered ancestor or stellar deity, as opposed to a qwuei or earthly spirit, a common ghost or demon. One can see a transition of sorts taking place in some of the sections of the Nei Yeh as it its practices may first have arisen from the practices of mediums who manifested the Shen, but in the Nei Yeh, shen appears as a ‘spiritual’ (Roth 1999, pgs. 68 & 70) aspect of the person and also as a “mind within the mind” that supervenes on the individual in a deep state of quiescence leading to an experience of ‘cosmic consciousness’ (Roth 1999, p. 72) in which one is aware of the deep connectedness of all things (Roth 1999, p. 82, but also Mencius VIIA 4). Eventually shen becomes a part of Chinese pneumatic physiology as the most refined aspect of human chi, and in this sense it can almost be considered ‘consciousness potential’, in particular the potential to manifest higher states of consciousness. In the Ming-te Mandala shen points both to this personal higher mind in which all things are reflected, but also to this refined spiritual energy which is the basis for its human manifestation. Thus it can now be seen that the Ming-te Mandala is a profound representation of ancient Chinese spiritual theory and practice.